Lettuce has been called ‘the perfect weight loss food’ and ‘rabbit food’ but it is so much more. With amazing healing benefits and 20% protein by calories it could be called ‘gorilla food’ instead. 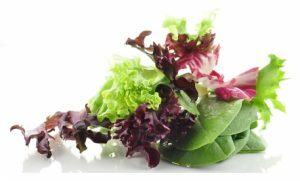 Learn about the types of lettuce and discover all the nutrition benefits and history of this amazing powerfood, and its few concerns. Romaine lettuce – This is your classic Greek salad. Sweet and crunchy. 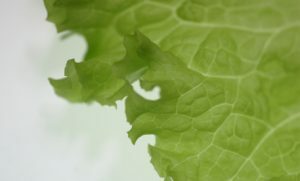 Iceberg lettuce – Crisphead. White on the inside. Crisp texture and mild taste. Butter lettuce – Boston and Bibb lettuce. Large green leaves that are soft and sweet. Red and Green Leaf: delicate taste and leaves. Arugula, watercress and mizuna are NOT classified as lettuce but are often mixed with lettuce in salads. They have similar nutritional benefits. As you might guess, my personal favorite is Romaine. I love the taste and nutrition but it is also much less likely to spoil than some of the others. I always have many bags of organic romaine heads in my fridge. I also keep a tub of organic field green or spring mix but much less since it spoils so easily. Choose romaine lettuce if you can instead of iceberg. Romaine lettuce has one of the highest nutritional values in the lettuce category. 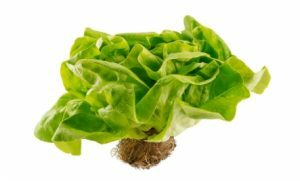 Most people are familiar with most of these types of lettuce but of them all, iceberg has the least nutrition. This follows the general rule to choose reds and green and dark coloured foods over whites. This means that red and green leaf lettuce is more nutritional than iceberg also. The Calories in Lettuce are Low and Almost no Fat. Lettuce has only 12 calories for 1 shredded cup. This is why it is so good for weight loss. Another reason it is good for weight loss. This fiber also helps remove bile salts from the body. When the body replaces these salts it breaks down cholesterol to do so. This is why lettuce is also good for your heart! Romaine lettuce has a 2/1 ratio of omega-3 to omega-6 fatty acids. That’s a great ratio. 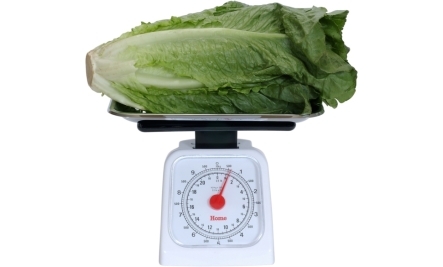 Calories in lettuce are not significant because there is so little fat. UNLESS you eat a lot but we actually suggest you do. Romaine lettuce has 20 % of its calories in protein. Like all whole foods, much of the protein in lettuce is complete but that amount can be increased by combining with balancing proteins. Question: What does a 400 pound gorilla eat at the salad bar? Answer: Anything he wants to! I don’t imagine gorillas gain all that muscle by just eating lettuce but here is a short video of one doing that very thing! Lactucarium has relaxing and sleep inducing properties similar to opium but without the strong side effects. Simply eat a few leaves or drink some lettuce juice. The minerals in lettuce help to remove toxins and keep your acid/alkaline balance in order. Once you are balanced on this level there are a host of benefits including greater energy, clearer thinking, deep restful sleep, and youthful skin. To read more go to Balance Your Body – With Alkaline Balance. Lettuce has an average glycemic index of 15 but because it has so few calories its glycemic load is considered zero. For anyone watching their blood sugars for medical reasons this is great. Low glycemic index also is great of weight management. Lettuce is almost always eaten raw which has many micronutrients not found in cooked or processed food. Eating raw food also adds vital energies not isolated or recognized by nutritional science. The large food corporations have not found a way to package lettuce long term or stick it in cans or boxes. Let’s hope they never do! Even though lettuce has very low calories, many varieties still have a sweet taste. To get maximum benefit from your food you should really WANT to eat it with your whole body not just your mind saying it is good for you. If you like the bitter taste you can find that too! The Chinese consider lettuce good luck and make sure eat it on special occasions. It has a high surface to weight ratio. Bugs and microorganisms love those tender lettuce leaves just as much as you. Therefore: Lettuce in on the list of Dirty Dozen – those foods you SHOULD buy organic. Discover the other 11 foods here: 12 Foods You Must Eat Organic. Luckily organic lettuce is getting more and more available. Perfect Vegetable Juice: Juicing is the perfect food for those with poor digestion and significant health challenges. Green Raspberry Smoothie/Pudding: It’s a healthy smoothie. It’s a tasty desert. Whatever you wish! Green Nori Salad: Enjoy the benefits of lettuce plus the nutritional punch from sea vegetables. Alkalizing Mixed Green Salad: This is your basic wonderful salad with lots of tastes and textures. Learn more about the most nutritious vegetarian foods you will always want to have in your fridge or growing on your deck. I’ll use them in larger quantities. Thanx! Good to hear that! I must say though, if you have lettuce growing in your garden RIGHT NOW, I am jealous! Most of my garden in under one foot of snow. Some of it is under three feet of snow. Interesting information about the nutrition facts. Romain lettuce is my antacid. I eat it plain by the leaf. Thank you for your informative newsletter. Very interesting about the antacid. Are you saying that if your stomach feels upset, lettuce stops that? If so that is good news for others. Thanks for sharing. That’s righ, Randy. I usually eat enough lettuce and other veggies to prevent heartburn, but when it does happen I’ll eat 2-3 leaves of romain and that settles it right down. The large green leaves are the most effective. First of all we are must thank you very much indeed. And second one we must appreciated to you for your excellent site. thank YOU Siavash for your kind comment! Comment…This information will save life.Thanks so much. This has seriously done a lot of good to my psyche. I’m happy I came across this article. I feel healed already. Thanks for sharing this useful info. Sorry, but no lettuce on earth contains 20% protein! If so it would be a superfood… Fillet steak has around 20% protein but for lettuce it’s more like 2%. My P.A. shared that iceberg is likely to aggravate heartburn more than Romaine!!! Because I have insomnia, taking care of my health is very important to me. However, I had no idea that the lactucarium in the lettuce could help with that. How often should I be eating lettuce to be able to benefit from its relaxing and sleep inducing properties? Better to eat wild varieties of lettuce because it free from the pesticides and insecticides. Better still grow your own organic lettuce. All summer I have fresh organic lettuce right from my garden. In the winter I buy organic lettuce. Your infirmation was very useful to me .now l know the difference between iceberg and romaine thank you for your tip and nutritional value. It was a brilliant write up and well put together. I will definately start eating more romaine lettuce . Great insight on the health benefits of lettuce. Eat healthy and be strong! BTW great gorilla joke! I red some time a go about lettuce able to reduce libido and good for sexual drive control. But i do not know if this was true? It’s Fritz ya surname ,please.i wanna cite u in ma review..
Mr. Fritz, thank you, I loved your article. Also, I was very interested to read that romaine helps a readers stomach upsets. Is it the fiber? I wonder, does heating lettuce ruin or reduce its health benefits? My SO won’t eat salad so I hide handfuls of it in homemade soup. Thank you so much. Is letuss good for people with pre diabetes. Good to eat? Yes, lettuce is good for everyone. It has no big sugar content.